In the Northern Quarter of Manchester, walking distance from Piccadilly Station. 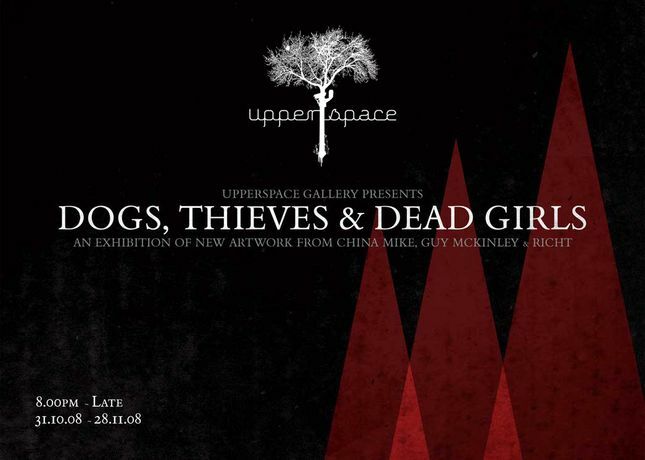 // FEATURING NEW WORKS BY: GUY MCKINLEY (http://www.guymckinley.com) RICH T (http://www.flickr.com/photos/richt) CHINA MIKE (http://www.chinamike-art.co.uk/) Upper Space, Manchester's only street art and graffiti gallery space, is pleased to announce the launch of our latest exhibition 'Dogs, Thieves and Dead Girls'. Featuring three of the UK's most exciting and contemporary street artists, each artist will be basing their works around a central theme and exploring the strange worlds of dogs, thieves and you guessed it, dead girls as we welcome in the witching hour of halloween....... Having painted throughout the Uk and Internationally, they now find themselves residing in the Upper Space and they will be taking to the walls, floors and ceilings in the style that they are renowned for. This promises to be our best show to date. Expect to see original works, screen prints and super rare collaborative pieces as we bring you into the fairytale world of our nocturnal heroes.